Sofa is essentially an app dedicated to media lists. With it you can search from among the four media types I've mentioned – TV shows, movies, podcasts, books – and add titles you're interested in to your own custom lists so you'll remember them later. It's like saving items in Apple Notes, but with several added benefits: each saved item includes artwork in the list view, plus a handy synopsis in its detail view, and items can be checked off as they're enjoyed, which adds them to your Activity log. 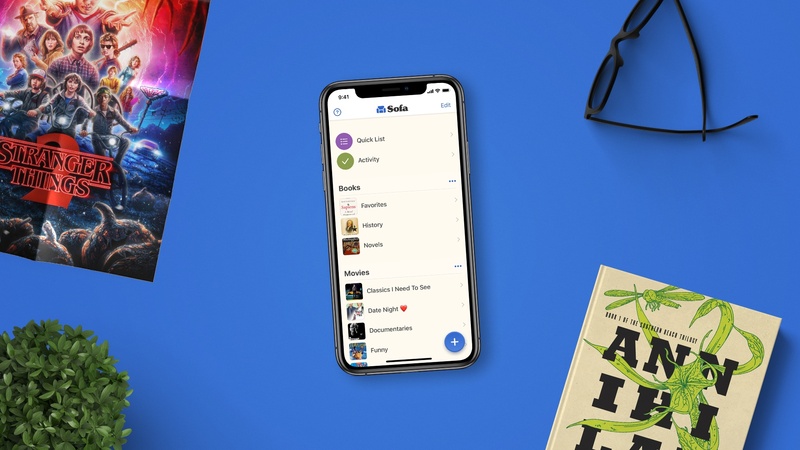 In its latest update, Sofa added support for Siri shortcuts to more quickly add new items to your lists; shortcuts can jump you straight to the search screen for a book, podcast, or movie/TV show. The feature I'm most excited about from this update though is sections. While Sofa has always enabled creating your own custom lists to save media to, now you can sort those lists into sections, which appear in the app's main view like headings; this is a great tool for creating a cleaner, more organized look for your lists. I've created a Media section for my primary Books, Movies, and Podcasts lists, and another section titled Streaming, which encompasses lists for different TV streaming services. I like to stay on top of cancelling TV subscriptions I'm not getting as much value from, so for example my Netflix account is currently inactive and has been for a few months. However, during those months Netflix has added a number of shows I've been interested in, which I've saved in Sofa. Checking each list inside my Streaming section provides a quick overview of all the interesting content I'd like to check out from each service, and when a particular service seems to offer enough to merit restarting a subscription, I'll do so and have a full slate of content ready to check out. Whereas some users will find their notes app of choice a sufficient place to keep media lists, I've found Sofa a much more pleasing dedicated tool for that task. It provides a healthy assortment of information on each item, which notes apps do not, and the inclusion of artwork makes a big aesthetic difference. There are also the added perks of things like haptic feedback when checking an item complete or adding something to a list. A dedicated app isn't needed for keeping media lists, but it can offer an improved experience, and Sofa serves as proof of that. Sofa is iPhone-exclusive and available on the App Store.